This is our 4th Dementia Olde Ale that has been bourbon barrel-aged. This ale has an intense sweet caramel malt flavor and aroma that develops into a toffee and toasted marshmallow-like character. Bottle received in a trade from spartan213. '12 vintage. Pours a fairly dark brown, basically opaque, with a small quarter inch head, and basically no lacing. Smells just incredible, I can't even describe most of it. Dark fruits, caramel, toasted marshallow, toffee, and bourbon. One of the most interesting beers I've ever had- like I said before, I can't really even describe most of these flavors. Caramel, raisins, figs, toasted marshmallow, oak, vanilla, cola, sarsaparilla, walnuts, bourbon. The aftertaste is this incredible blast of caramel and bourbon- almost like bourbon-soaked Werther's candy or something. This is just so unique and awesome. This is fairly thick bodied, with a sweet and mucho syrupy mouthfeel, and a very low amount of carbonation. Although I really want to slowly sip this, it's really hard to not just gulp it down, it's so drinkable. This might be the best beer I've ever had. While drinking it, I honestly had no idea what was going on. Pours a rich, viscous amber, syrupy in color/appearance. Thin tan head forms with a vigorous pour but dissipates immediately leaving just a trace of a collar. English toffee, burnt sugar, toasted marshmallow, vanilla, oak, and coconut all peak through in the aroma with just the slightest hint of booze. All of these sweet, luscious smells come out in full force in the taste. Incredible depth and richness of flavors; the barrels are prominent but not dominating, instead balancing and complimenting the massive caramel sweetness/toast/oakey vanilla tannins/leather. Once the sweetness begins to drop, you're hit with huge sweet cherries/dates/dark fruit and a lingering hint of booze. Sticky lacing is left clinging to the glass. Mouth feel is full-bodied, sweet, syrupy, but the carbonation level is perfect to move this sweet malt bomb around the palate. Overall, it easily ranks as one of my absolute favorite Old Ales, it's simply fantastic and dangerously quaffable. S - Wow, this is possibly one of the craziest smells I've ever experienced. Huge caramel, oak and toffee notes. Brown sugar, dark fruits, cherry and maybe some fig. Can barely smell the alcohol. T - Very complex and similar to the nose. One of the sweeter beers I've had. Love the huge caramel taste. M - Medium body with very minimal carbonation. Get a little bit more of the alcohol as it warms up. Very syrupy. O - This is an amazing beer. Definitely top 10 for me. I've never really had a beer like this. Serving: 12 oz. bottle poured into a Founder's CBS snifter. No bottled on date, but this is 2015 vintage, so maybe 2-3 months old at this point. A: Pours a syrupy-thick, mahogany-brown color. Just a hand-full of bubbles in a very calm beer. Some light getting through. S: Apricot, fig, maple syrup, plum, dark cherries, vanilla. The bourbon is very faint on first pass, but a good whiff reveals it. Comes through as a more oaky, leathery note, and less wet, fresh bourbon. T: Big fig, jam, plum, and caramel notes up front. Some vanilla and toffee in the middle. Finish leaves more of a slightly booze-tinged character than an overt bourbon note, but lets you know that there's some barrel presence there. M: Just brilliant. This is about as thick and chewy as you'd want for a barrel-aged beer, regardless of the style. The high-ABV is well hidden. Carbonation level is right in the sweet spot. 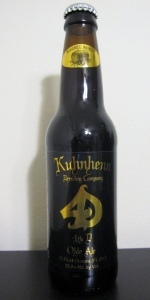 O: Kuhnhenn is my hometown brewery, as I grew up a short 15 minutes away. However, I didn't discover it's place in the craft beer universe until 1 or 2 years in. A very small, unique place, Kuhnhenn has a similar ethos to Founder's in that they do it their way. After my first Winter Solstice in 2012, it instantly became one of my favorites. BB4D is a legend, and 3 years later, it still holds up as a classic. This beer, for the style, has it all. It's rich, sweet, decadent, layered, and above all delicious. It's truly an achievement to craft a beer this drinkable and tasty. My only small critique is that I would like a bit more barrel presence here. Not sure if it was more predominant a few years back, but it's just a tad mute here. Maybe I'd have to have it side by side with 4D to truly appreciate it, but bourbon isn't the first thing that comes to my mind when drinking this one. Nonetheless, it's an under-the-radar beer that deserves a bit more acclaim than it already has. Recommendation: Mandatory drinking for lovers of all things barrel-aged. Best old ale I've ever had. Super dark brown in color and somewhat boozy on the nose, but, man...this is just smooth, caramel coated candy bar without ever being actually sweet. Coating mouthfeel, nice pleasant warming sensation. Truly wonderful. I was hesitant to crack this, now I wish I had a few more. Much better than I expected, as I'm not typically a huge fan of the style. Definitely a recommended brew. A - Pours thick, dark brown. Not much head, and dissipates quickly. S - Dark fruits, fig and raisins are the meat of it. Strong bourbon and vanilla notes round it out. Could whiff this all day long. T - Awesome. A lot going on here. Thick, malty maple syrup notes up front. Strong bourbon flavors on the swallow, but not enough to put it out of balance. This is a perfect example of what bourbon aging can do to a beer without being overpowering. M - Not giant stout thick, but pretty heavy for the style and syrupy. O - This is a superbly done beer and the best of the style I have sampled. Definitely in my top 10 brews. A: Quite hazy deep brown. Tiny bit of loosely distributed head vanishes quickly. S: Tootsie rolls, toasted coconut, vanilla, dark buttery caramel, booze, dry cocoa, a hint of smokiness. Big malt fruitiness. Very inviting, sweet, smells amazing. T: Sticky toffee, slightly maple-ish, sappy sweet malts, fruity esters. Leaves my lips smelling like caramel corn afterwards, absolutely delicious. M: Almost flat but perfect for the style and size of this beer. A great beer to sip over a few hours. Slick, huge, boozy, delicious and unique. Got this one through a trade. Thanks! T: Bourbon, vanilla, brown sugar, caramel, chocolate, very sweet and boozy. In the middle, I can also taste something a bit tart? or sour? Very well done! O: I enjoyed this one very much! I love bourbon aged beers, and this is definiely one of my top 3 I had. Glad I have another bottle on the way to age. I picked up a good number of these at the 2010 Winter Solstice, $7.50 each. Since then I've had the chance to pick up a few more at the brewery, same price. It seems expensive for 12oz bottles (as do all the Kuhnhenn beers), but in this case the high cost is justified. It pours a dark murky brown, clearer at the edges, minimal head. Huge aroma, sweet and malty, lots of bourbon, a good dose of vanilla too. Sort of hot tasting, but in a very good way. The bourbon is very well integrated into this beer, sweet but not to a fault, burning but not overly so, massively tasty. Thickish liquid for a barrel aged beer, low on carbonation but that works well in this case. Among my favorites from Kuhnhenn, this is excellent stuff. Nearly flat, but that's expected. Opaque and light brown I watch as carbonation escapes the surface of this beer. Complex aroma, woody barrel, bourbon and brandy, booze is prominant, some nice leathery quality and hints of vanilla and chocolate. A big mouthful of bourbon, smokey notes, leather and ash; oak is there too. Chocolate, vanilla and booze too. Sticky and thick, oily, just perfect. A little hot but that is excusable at such a high abv. Beers like this grow my like for this style more and more. A really great sipper, nothing could be better about this beer.